When you play a shooting game you find very interesting aspects of the games. There are shooting techniques, defined strategies, network, utilizing gaming assets, and other important hacks. Because of that, we have decided to help you with some of the Phantom Forces tips and tricks. Make use of these tips and tricks to get better at the game in a most effective and easiest way. Most of the tricks are identified from professional game play. Use the Map: First tip is the usage of mini map. You need to look at the map if you are not sure about the enemy’s position when he or she is attacking you. You should look at the red mark on the map to find the direction. Even footsteps will help you to find the location of nearby enemies. Use Listening Skills: This is very important in the process of finding and killing your enemy. Listen to the footstep loudness and direction. Based on it predict the positon. Listen to gun sound. If the sound is an automatic gun’s sound you Scan wait till the reload sound. If its sniper just wait for one bullet and peek and get back to find position. This is one of the most important Phantom Forces tips and tricks. Use Prone and Crouch Position: This might not be that interesting but it is highly effective. Use the hiding position, prone, crouch, sleep and surrounding buildings to find the enemies and hide from enemies. Do not overdo it else you will not progress in the game in an effective way. Movements: When you want to move in a normal place with very less or no enemy then you can go for simple movement. If you sense enemies use buildings, jump and crouch methods to kill. If you find an enemy with better aim then prone and shoot and move then jump. Bullet Drop: This is one of the top Phantom Forces tips and tricks during long range shooting. When you want to use sniper to shoot an enemy use the aim slightly high tip. You need to high just above the head so that you can hit the head as scope position will be at higher position. Use this trick and you will notice that you will be killing more enemies with snipers. Shooting Speed: Everybody uses auto shooting method. If you want to save your bullets when you do not have enough ammo, then you can set it to semi or burst mode and attack. This will increase the aim and further it increases effectiveness. 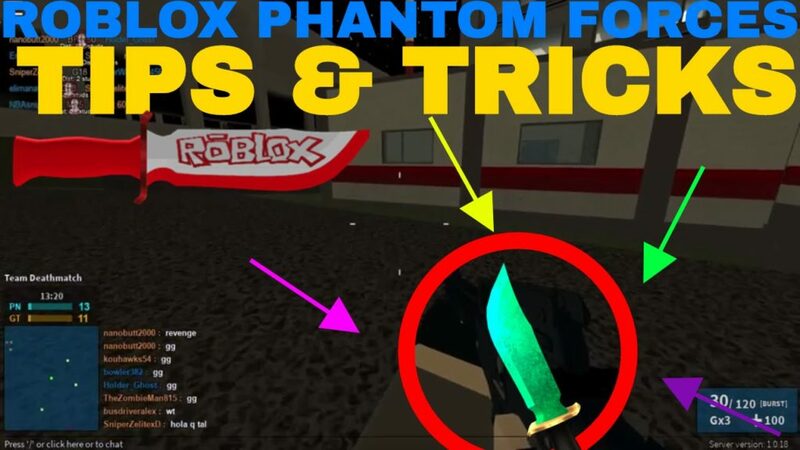 These Phantom Forces tips and tricks are very important in actual gameplay. Enjoy.